Public Opinion in the United States tracks developments in American society since World War II through the lens of public opinion. 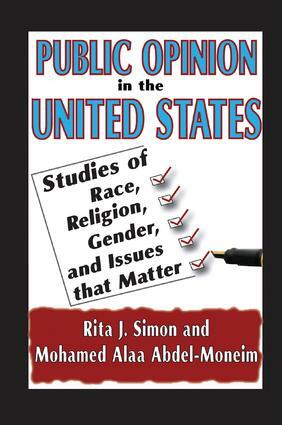 The authors assess national public opinion poll data from 1945 to 2008, targeting opinions about African Americans, Jews, Muslim Americans, gays and lesbians, immigration, abortion, and affirmative action. The authors consider whether American attitudes have developed faster than Supreme Court decisions in the areas surveyed. They assess how social change is processed by the public, how people responded to the race riots of the 1950s and 1960s, and how the war in Vietnam shaped new perspectives on issues such as race, citizenship rights, and the role of the individual. Each chapter begins by introducing the political, social, or international events that were critical in setting the stage for influencing public opinion in each decade since World War II. The volume provides a unique portrait of American society and how it has changed over the last sixty plus years. The reader will learn whether Americans are more or less prejudiced against blacks, Jews, and Muslims than they were in earlier years; whether their views on immigration, affirmative action, and abortion have changed; and when views have changed, in what direction. Do men and women, rich and poor, more and less educated, secular versus religious share the same views? And if there are differences, what directions do those differences take? Th is work describes American society in 2008 compared to the post-World War II era, and it offers stunning glimpses at the future.